WASHINGTON -- consumer spending unexpectedly fell in July as savings rose to its highest level in more than 1½ years, indicating that households remain cautious despite an acceleration in economic growth. The Commerce Department said Friday consumer spending dropped 0.1 percent last month, the first decline since January, after an unrevised 0.4 percent gain in June. 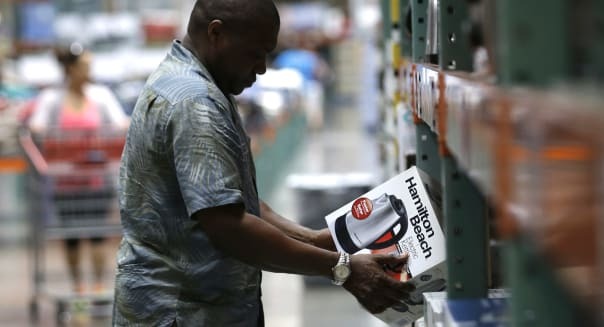 Economists had expected consumer spending, which accounts for more than two-thirds of U.S. economic activity, to increase 0.2 percent in July. When adjusted for inflation, it slipped 0.2 percent after gaining 0.2 percent in June. The weakness in consumer spending at the start of the third quarter will probably do little to change perceptions that the economy has retained much of its second-quarter momentum. Other sectors of the economy such as housing, business spending, exports and government activity are accelerating. In addition, labor market conditions are strengthening. The dollar fell against a basket of currencies after the data. U.S. stock index futures were trading higher. The government reported Thursday that the economy expanded at a 4.2 percent annual pace in the second quarter, with consumer spending growing at a 2.5 percent pace. Third-quarter growth estimates currently range as high as a 3.6 percent rate. Savings increased to $739.1 billion in July, the highest level since December 2012, from $709.4 billion in June. At 5.7 percent, the saving rate was also the highest since December 2012. The increase in savings came even as income posted its smallest increase since December. While rising savings bode well for future spending, confidence among households will probably need to increase significantly for spending to pick up. With consumption weak, inflation pressures were muted in July, giving the Federal Reserve room to keep its benchmark overnight lending rate near zero for some time while it awaits an acceleration in wage growth. A price index for consumer spending edged up 0.1 percent after increasing 0.2 percent in June. That was the smallest rise since February. In the 12 months through July, the personal consumption expenditures, or PCE, price index rose 1.6 percent. It also increased by 1.6 percent in June. Excluding food and energy, prices inched up 0.1 percent after rising by the same margin in June. The so-called core PCE, which is the Fed's favorite inflation measure, increased 1.5 percent in the 12 months through July, continuing to run below the U.S. central bank's 2 percent target. It had advanced 1.5 percent in June. Last month, income increased 0.2 percent after rising 0.5 percent in June. Income at the disposal of households after adjusting for inflation and taxes nudged up 0.1 percent after increasing 0.3 percent in June.